PSA Group's bid to create a European auto giant by acquiring GM’s European unit may be the best chance Peugeot, Citroen and Opel have to thrive as high-volume, low-margin manufacturers. Buying Opel and its sister brand, Vauxhall, would immediately give PSA CEO Carlos Tavares a larger slice of a fiercely competitive market and open up opportunities for savings. The French manufacturer, fighting to contain costs, is losing customers to more attractive and often more affordable models from Fiat and Renault. "Tavares has few options to grow sales, and attempts to expand worldwide are a struggle," said Ferdinand Dudenhoeffer, director of the Center for Automotive Research at the University of Duisburg-Essen in Germany. "So he’s grasping at straws to get ahead." Europe's automotive landscape is set to become even harsher as the demand cycle peaks, pollution standards tighten and young drivers turn to car-sharing and ride-hailing services. While PSA and GM's European brands are still among the region's biggest, neither company has found a way to halt an erosion of market share over the past decade. While Peugeot, Citroen and Opel have seen their portion of Europe's sales diminish, regional leader Volkswagen Group expanded its footprint to about 24 percent from about 19 percent over the past decade, even as it lost customers in the wake of a diesel-cheating scandal. And Renault ousted PSA as the region's No. 2 carmaker last year after luring buyers with a wider range of models, including the top-selling Megane hatchback and popular new SUVs like the Kadjar. Both PSA and Opel are high-volume, low-margin manufacturers that produce vehicles in countries with high labor costs, including Germany, France and the UK. GM has been pulling back from its Opel brand for years, while dropping money-losing businesses elsewhere. It has largely withdrawn from Russia, shuttered production in Thailand and Indonesia, and pulled the Chevrolet brand out of Europe. Opel and Vauxhall racked up losses of $1.1 billion in the past two years, and more than $20 billion since 1999. PSA is still recovering from near-bankruptcy after being rescued by the French state and China's Dongfeng Motor Corp. in 2014. Tavares, who took over three years ago and led a restructuring that included closing a plant, freezing pay and weeding out underperforming models, has shifted his focus to expansion. He sought to grow overseas to reduce dependence on Europe, where the company sells about 60 percent of its vehicles, but those plans haven't panned out. PSA's share in China has been shrinking as competitors such as Volkswagen were better able to read local needs, and a plan to expand into North America within 10 years faces an uncertain future as U.S. President Donald Trump threatens trade barriers. While Opel's price tag could exceed 2 billion euros, according to analysts at Macquarie Research, the purchase would instantly boost PSA's deliveries in Europe by about 68 percent to an annual 2.5 million vehicles. That would give the combined company a 16 percent share of the market, second only to Volkswagen. What's more, combining brands could yield annual savings of as much as 1.9 billion euros ($2.02 billion) through the sharing of development and production costs, according to Alexis Albert, a Barclays Plc analyst based in Paris. Companies must spend billions of euros to develop new technologies, and are seeking ways to spread that cost over a wider platform, the way Volkswagen and also Renault -- through its alliance with Nissan -- have done. Gaining access to GM's electric-car technology would help PSA. Opel's Ampera-e, able to drive 520 kilometers (323 miles) on a single charge and due for release this year, shares battery technology with GM's Chevrolet Bolt, already on sale in the U.S. By contrast, PSA’s electric vehicles, which are made by another manufacturer and marketed as the Peugeot iOn and Citroen C-Zero, aren't gaining much traction. Opel and PSA have already been collaborating. Opel's all-new Crossland X SUV, slated to go on sale this year, is the result of a 2012 development partnership. The car will be built on the same platform as Citroen's C3 Picasso at Opel’s Spanish plant in Zaragoza. Opel also plans to unveil the larger Grandland X this year, which will come off PSA's Sochaux production line in France, together with the Peugeot 3008. To be sure, it could take years for cost savings to be fully realized. By then a lot could go wrong in Europe, where the companies sell about two-thirds of their cars. Auto deliveries in the region are set to rise just 1.8 percent this year and 1 percent next year, down from 6.5 percent in 2016, according to data compiled by forecaster LMC, as the market nears a peak after three years of gains. PSA's over-reliance on Europe brought it to the edge of collapse four years ago. "There are clear signs we're approaching saturation in Europe, after years of catch-up demand," said Stefan Bratzel, an auto industry researcher at the University of Applied Sciences in Bergisch Gladbach, Germany. On the upside, carmakers that can squeeze out costs will be better positioned as sales plateau. PSA has shown it's capable of cutting back, delivering a profit margin of 6.8 percent from automaking during the first half of last year, compared with 5 percent for the previous period. And for all of their overlap, GM and PSA don't compete that much geographically. 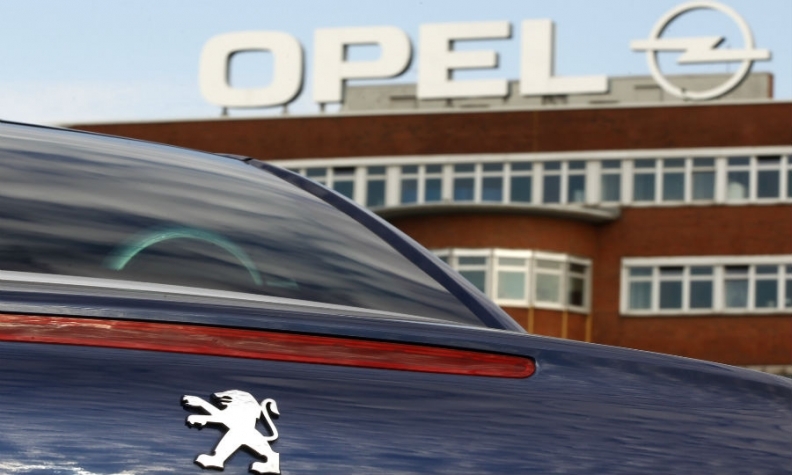 While Opel appeals to budget and mid-market buyers in Germany, and Vauxhall has the same niche in the UK, Peugeot and Citroen are more popular in France, Spain and Italy, data compiled by IHS Markit show. "In a market that's approaching the peak," said Bratzel, "it's about having the best product at the lowest cost."